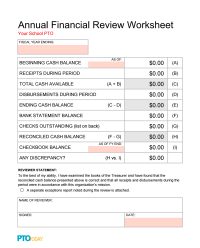 Provide this worksheet along with the Annual Financial Review Guidelines to help your volunteer auditor conduct a thorough audit of your parent group's finances each year. From the Treasurer's Toolkit. 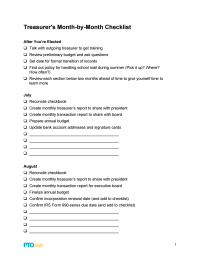 Year-round list of tasks for parent group treasurers, divided by month. Add your own tasks, too! From the Treasurer's Toolkit. Downloads: 248 Members only ? 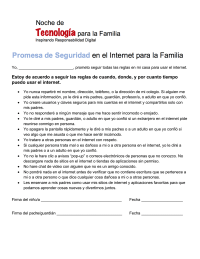 A Spanish translation of the Family Internet Safety Promise from the free Family Tech Talk Night planning kit, contributed by Siler City (N.C.) Elementary. 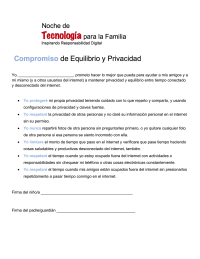 A Spanish translation of the Privacy and Balance Pledge from the free Family Tech Talk Night planning kit, contributed by Siler City (N.C.) Elementary. 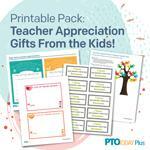 Help students create sweet and from-the-heart gifts for their teachers with this collection of personal note cards, job coupons, heart tree crafts, and love notes! Downloads: 184 Members only ? Downloads: 58 Members only ? 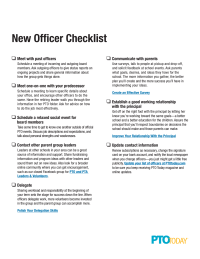 Important steps for newly elected officers to take following a parent group election. Exclusive access for Plus members to read the February 2018 issue of PTO Today anytime (even before it's mailed out)! Hint: most of the links in the PDF are clickable. Downloads: 62 Members only ? Exclusive access for Plus members to read the January 2018 issue of PTO Today anytime (even before it's mailed out)! Hint: most of the links in the PDF are clickable. Downloads: 38 Members only ? Downloads: 39 Members only ? Mega list of service projects has ideas for groups of all sizes and experience levels to use or adapt. 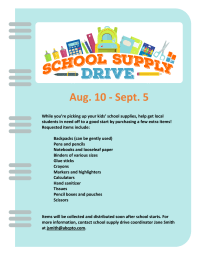 Editable flyer to use for promoting a school supply drive by your group or school. Get exclusive access to the digital versions of PTO Today magazine with your Plus membership! Read the September 2017 issue even after your school copy has been passed along (hint: most of the links in the PDF are clickable). 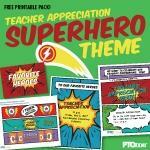 Plus members get exclusive access to the digital versions of PTO Today magazine! Read the August 2017 issue even after your school copy has been passed along (hint: most of the links in the PDF are clickable). Downloads: 7 Members only ? Put together a teacher survival kit—on the cheap!—for back to school or anytime. Customize these labels with each teacher's name, then print on a sheet of self-stick labels or on card stock to cut apart as gift tags. For $5 or less you can get a mug and fill it with ibuprofen, antacid, earplugs, an energy bar, a bag of tea, and a few pieces of individually wrapped candy. A fully editable and customizable spreadsheet form to provide to community members who make donations to your federally recognized 501(c)(3) tax-exempt group. 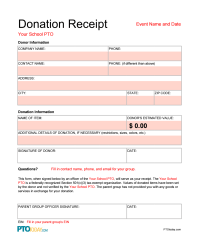 Formatted with space to fill in your group's name, EIN, and event details as well as other details related to the donation received. Downloads: 430 Members only ? 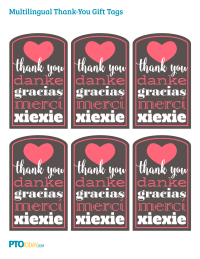 Say thanks to volunteers, teachers, or anyone else in the school community in five different languages! Punch a hole at the top and attach with a ribbon, tape to the front of a gift, or write a note of thanks on the back. Three different tag designs are included in this file.